If what you have been searching for is a lightweight and great all-around hunting knife that can be utilized for various applications, then it’s high time you checked out the Buck Knives 124 Frontiersman Fixed Blade Knife. It comes with an ergonomically designed handle as well as a sharp blade, which means that the item can give you plenty of value for every cent spent. Let’s look at some of the features that make this item unique so that maybe you can make up your own mind about giving it a try or not. We found that it is significantly more budget-friendly than others, so this one definitely speaks to the needs of beginning hunters who aren’t prepared of making a huge investment. Every hunter needs a quality knife because it is one of those tools that can help him or her effectively while they are in the field. In choosing one, you don’t just have to go for the most popular model. You have to consider things like the materials that have been used for its construction, its design, its functionality, as well as the quality of the blade. The 124 Frontiersman seems to be a winner in all of these respects. The blade measures 6.25 inches and is crafted from 420HC steel. It has excellent corrosion resistance, amazing edge retention, and its strength is also something to write home about. The overall length of the product is 11.75 inches, so it is not the smallest knife in its class. It weighs in at 13.3 ounces, and many users say that this weight is perfect as it gives them the feeling that they’re actually benefiting from a solid grip. 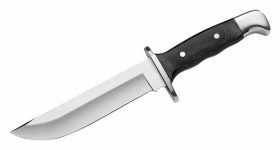 An area where this product really shines is its handles since it is made of Micarta and it boasts an aluminum pommel and aluminum guard. The unit is accompanied by a leather sheath. The blade is corrosion-resistant, and you can re-sharpen it with ease. It also has excellent wear-resistance properties, which means that it can last you for a long time. If you do fail to be impressed by what this blade can offer you or you receive a product that is faulty, you needn’t worry about anything since this one is backed by the Buck Forever Warranty coverage. Therefore, you can simply get in touch with the brand’s customer support if you run into any issue of this sort. What about the design? 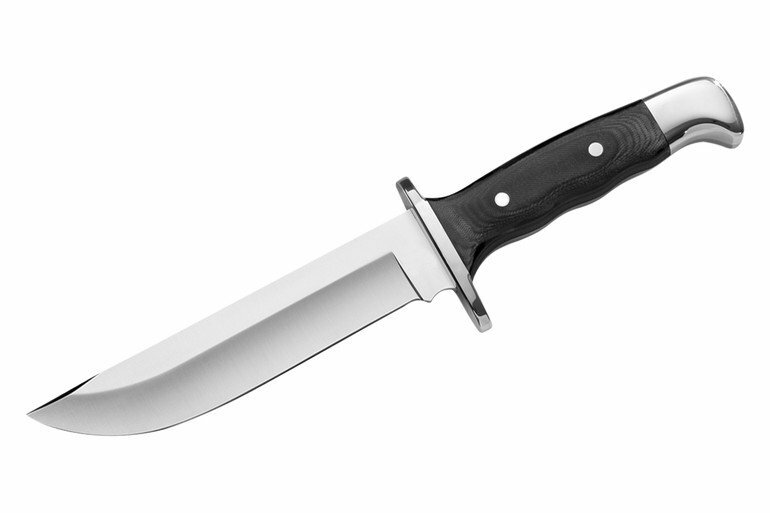 The 124 Frontiersman Fixed Blade Knife is made in such a way so as to be able to serve you even in the most challenging situations. It has strength and tenacity and can be utilized for the heaviest duty tasks. It’s sleek and sharp, and while we’re at it, we might also add that it’s also easy on the eyes. Since it comes with a lightweight design, it won’t hang heavy on your belt or in your hunting pack. As stated before, this product comes with a high-quality sheath made out of leather to which a snap fastener has been added. The integrated belt loop enables you to carry the knife safely and securely on your belt so that you reach for it whenever you need it the most. While the sheath is not made in the US, the knife is – we added this bit of information for those of you who are not looking to purchase a cheap item that doesn’t last for a decent amount of time. When it comes to the owner feedback that this product has garnered, we couldn’t fail to notice that it has gathered the appreciation of many hunters, hikers, campers, and survivalists. Many of these individuals report that they received knives in a perfect condition in terms of the finish, fit, and materials. Others argue that the geometry, sharpness, weight, quality and balance of this knife are unparalleled and can’t even compare to some of the other such tools that they have tried out in the past. One area where this option won’t be able to help you is chopping wood. However, considering the fact that it is not primarily marketed for survival purposes or for various outdoor applications aside from hunting, we’d argue that you’d have to use a different tool for this type of activity. In short, this USA-made fixed blade knife can definitely be a useful hunting tool, especially if you are on the hunt for a heavy-duty alternative. It is solid, reliable, and versatile, and it will last you for a good deal of time.